Being in airlines business is a really tough one. Trying to maintain profits in this business is an even tougher challenge. All this makes it an absolute necessity for these airliners to find “innovative” sources of revenues. Airlines in India are no exception and I was appalled to find their latest innovation in charging customers for not providing an value added service. 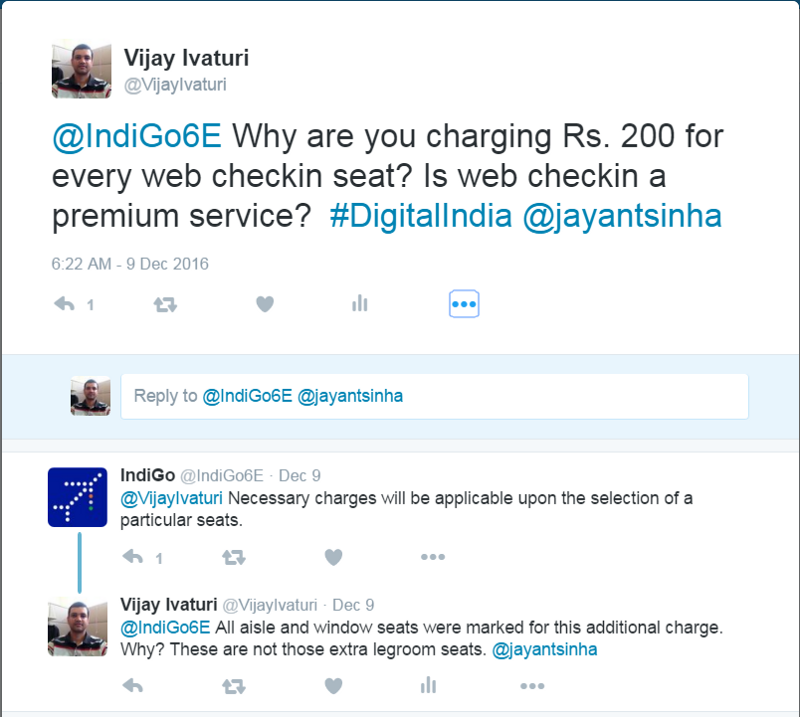 When I went to the web portal for Indigo airlines and tried to block my seats, I found to my dismay that 80% of the available seats had an additional charge of at least Rs 200, for every seat I wanted to select. Disgusted with the greed of these airline companies, I chose the last row where there was no premium to select seats. When I checked with Indigo through Twitter, they confirmed this is as planned and approved by Government of India. Yet another shocker. It is unbelievable that an airline is allowed to charge customers for a service that they were supposed to provide hassle free in the first place. How would you feel if your newspaper guy fixes the price of daily newspaper based on when you want it to be delivered? Rs 6 if you want the newspaper at 7 AM. Rs 3 if you want it by 10 AM! Howzzaaat! It is all there for everyone to read. 60% of the flight will be covered by this premium seating program. Sad. Step into any major Indian airport during morning hours — the checkin counters are a sight to behold. Absolute chaos. This is a daily mess that Airports Authority of India, DGCA and Airlines have unleashed on passengers. A web checkin was supposed to be the only option available to passengers to reduce their wait time at these airports. And now, they want to cash in on the pain that they created in the first place. Lets hope such horrible pricing policies are not encouraged and passengers protest more to name and shame these airlines. If airlines want to generate more revenue, do it by creating products and services that give value to customers. Exploiting your passengers is not the right way to go about this.